A must visit site in St. Petersburg is the Catherine Palace and its Amber Chamber. The complex is part of a complex of palaces and parks of the city of Pushkin, declared a World Heritage Site. In this post I will explain you how to get there and how to buy tickets online to avoid lines. 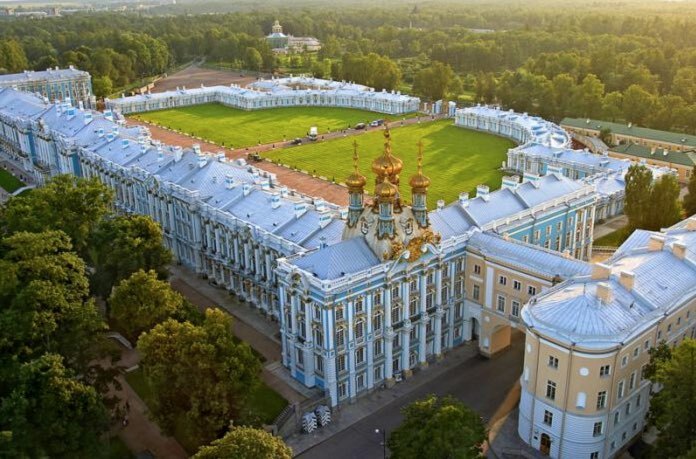 A must visit if you travel to St. Petersburg, besides the Hermitage and Peterhof, is Catherine’s Palace, a spectacular palace which was summer residence of the tsars. The palace is located in the town of Pushkin (formerly Tsarskoye Selo), about 25 kilometers southeast of St. Petersburg. The complex is part of a complex of palaces and parks of the city of Pushkin, declared a World Heritage Site. In this article I will make a brief review of the history of the palace and explain how to get there and how to buy tickets online to avoid lines. 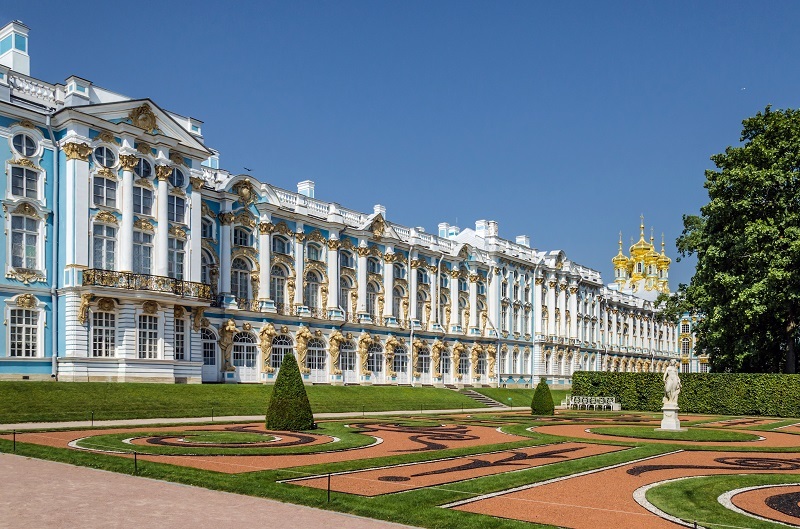 The palace has its origins in 1717, when Catherine I of Russia hired German architect Johann-Friedrich Braunstein to build her a summer palace for her distractions. Empress Elizabeth remodeled the palace to her taste in 1752, making it more luxurious and using more than 100 kilos of gold to gild the facade and the roof statues. However, the Palace is associated with Catherine II of Russia (called the Great), who stopped the works, when she was informed of the high costs and that in her memoirs criticized the reckless extravagance of Empress Elizabeth. Empress Catherine II hired a Scottish architect who renovated the palace to the neo-Palladian style (which was fashionable at the time) and constructed the personal apartments of the Empress, as well as new structures in the park for the entertainment of the Empress. The palace was looted by Nazi troops during World War II, but was rebuilt for the tercentenary of the city of St. Petersburg in 2003. 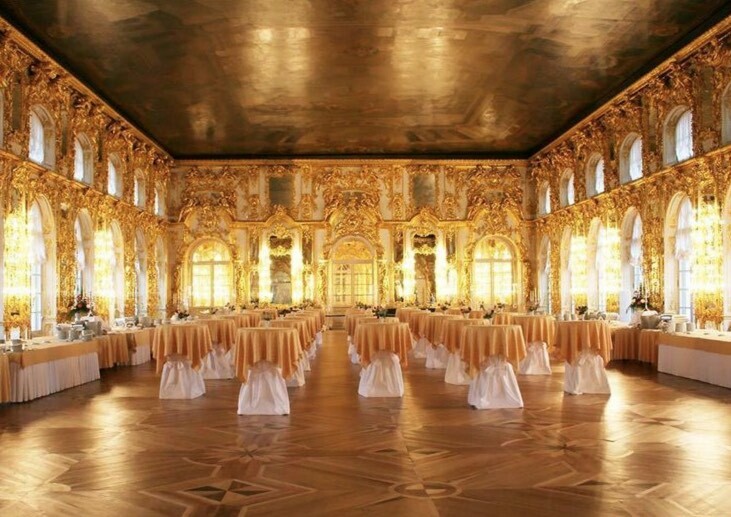 Among the different rooms of the palace there is a ballroom and, above all, the Amber Chamber, a luxurious room of the Tsar, composed of a set of panels, baseboards and furniture made up of thousands of shards of amber (a gemstone formed of vegetable resin). This chamber was dismantled by the Germans and taken to Königsberg Castle, where it was exhibited in 1941. This castle was damaged at the end of World War II and it was never heard of Amber Chamber again for the time. 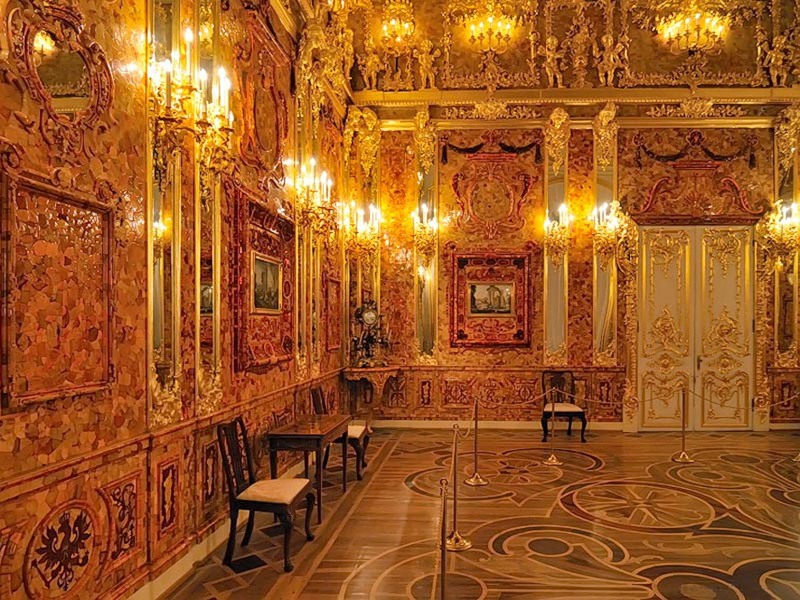 In 2003 the Chamber was replaced by a copy located right in Catherine Palace itself, made with resources from German companies and Russian and German artists. Vladimir Putin and the German Chancellor Gerhard Schröder, inaugurated it on the 300th anniversary of the city of St. Petersburg. In the animated film, Anastasia, by Twentieth Century Fox, in 1997, the Catherine Palace is represented, erroneously, as the home of the imperial family. To raise funds for the reconstruction of the palace (which still continues), the administration of the palace has rented the Great Hall on several occasions for some high-level events, including a concert by Elton John for an elite audience in 2001 or exclusive party held in 2005 with celebrities like Bill Clinton, Whitney Houston, Tina Turner, Sting or Naomi Campbell. It is forbidden to take photos in the Chamber of Amber because it is very sensitive to camera flashes. You can’t also take selfies inside the Palace for security. In winter, schedules differ and may be changing so it is best to consult them on the Palace’s official website at this link: http://tzar.ru/en. From October to April, the palace also closes the last Monday of each month. 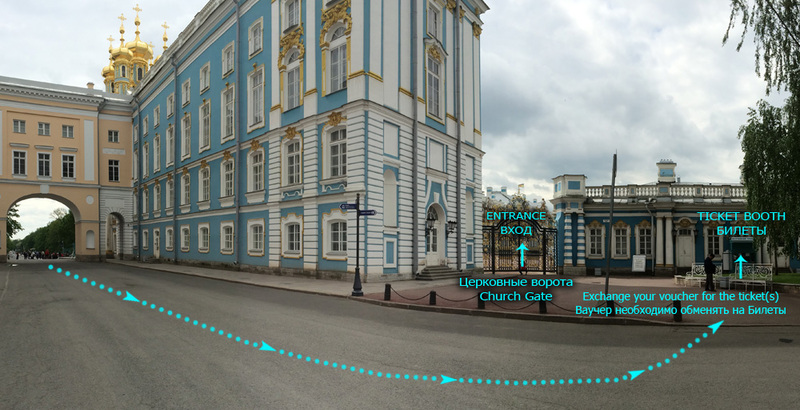 Catherine’s Palace is located 25 kilometers south of St. Petersburg. 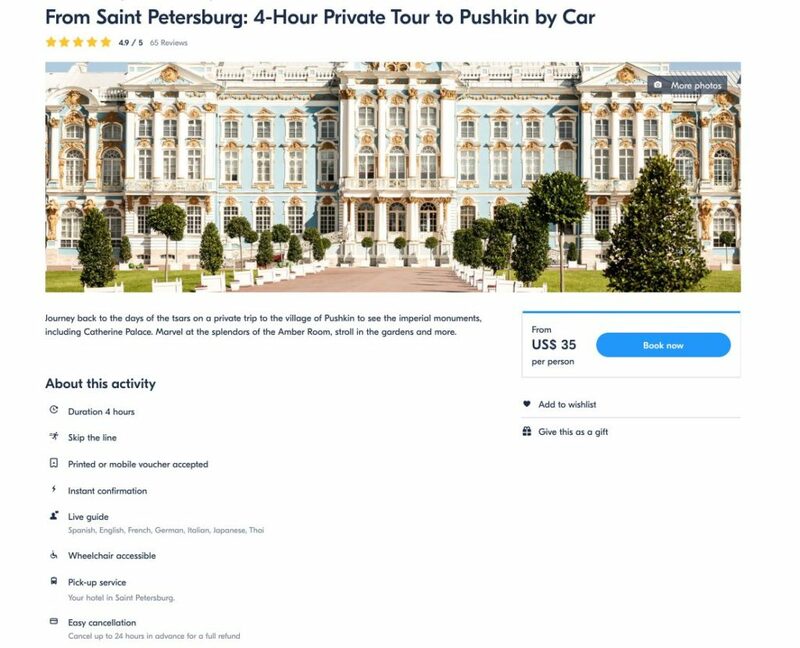 You can go from the center of St. Petersburg to Catherine’s Palace by public transport (cheaper but involves combining two transportation methods and a longer ride) or taxi (more expensive but more direct and faster). 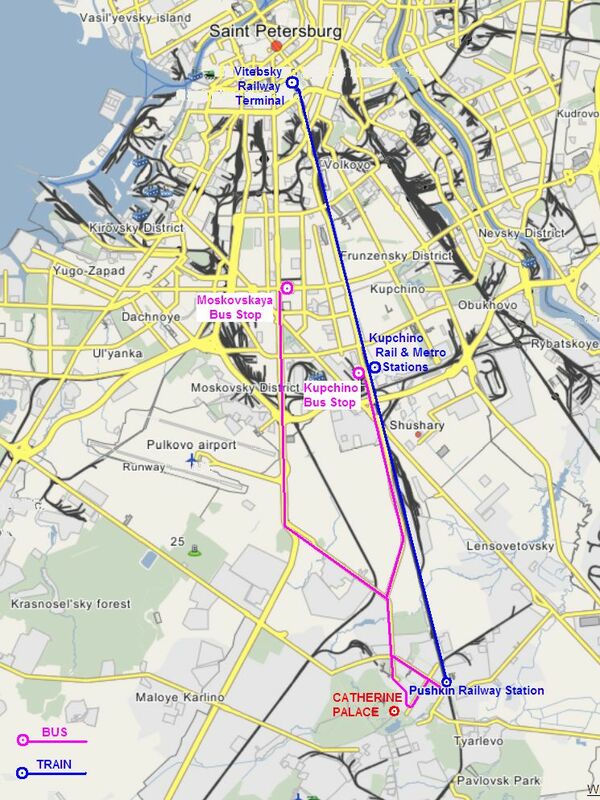 From Vitebsky train station, buy the ticket to Pushkin (Tsarskoye Selo) suburban train station. Taking any of the above combinations may take some time to reach the Palace, so if your time is limited, a good online option is to hire a taxi that will take you straight. 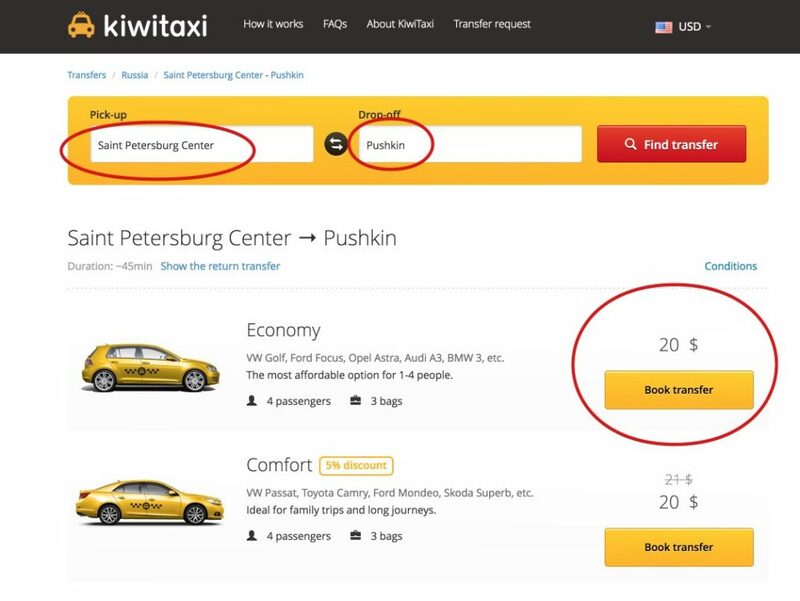 For example, in Kiwitaxi the ride costs about US$ 20 (for up to 4 people) and it can be contracted online, indicating the time at which you want them to pick you up and exit the hotel (or your address at the time). You must indicate the city of Pushkin as destination. 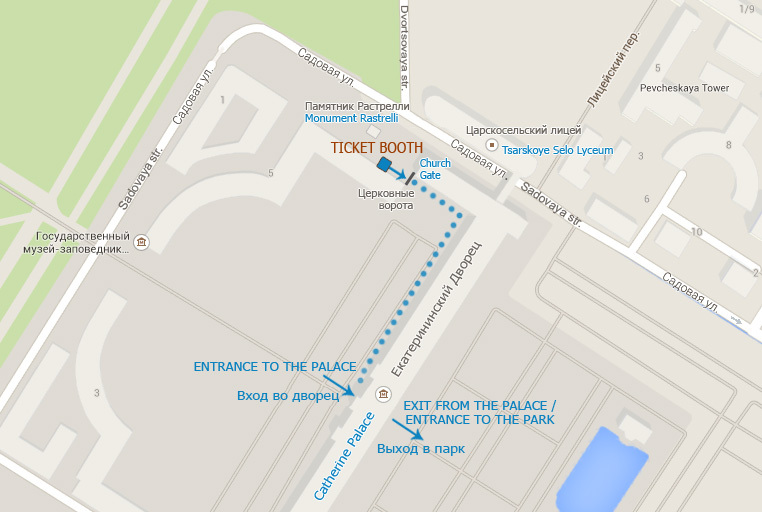 In summer, long lines can be formed to visit the Palace, so it’s a good idea to buy tickets online in advance. 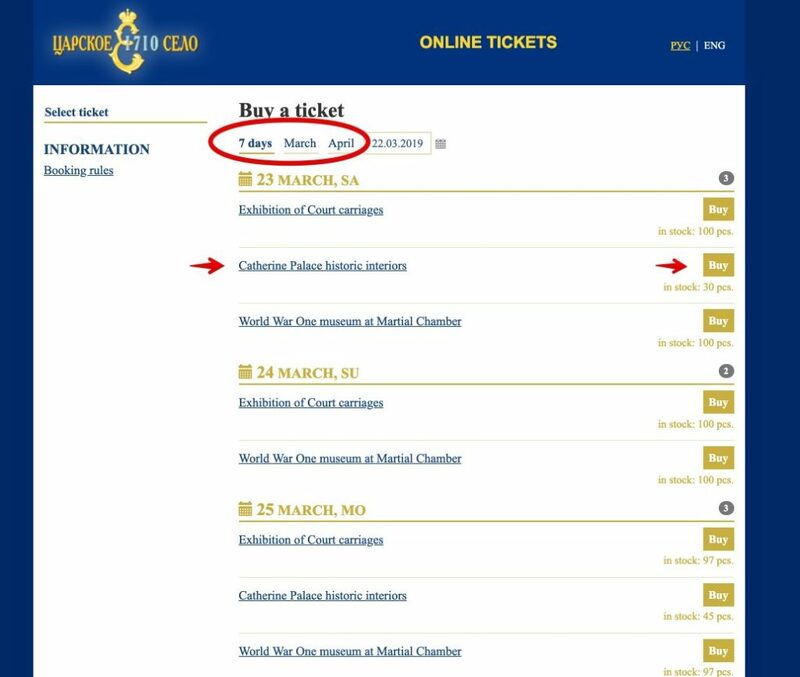 On the Palace’s official website (http://tkt.tzar.ru/en/) tickets are sold online for the visit of the Catherine Palace and for exhibitions in other pavilions (for example, Exhibition of Court carriages or World War One museum at Martial Chamber). You can buy tickets with maximum 14 days in advance and a maximum of 4 entries in each online purchase. 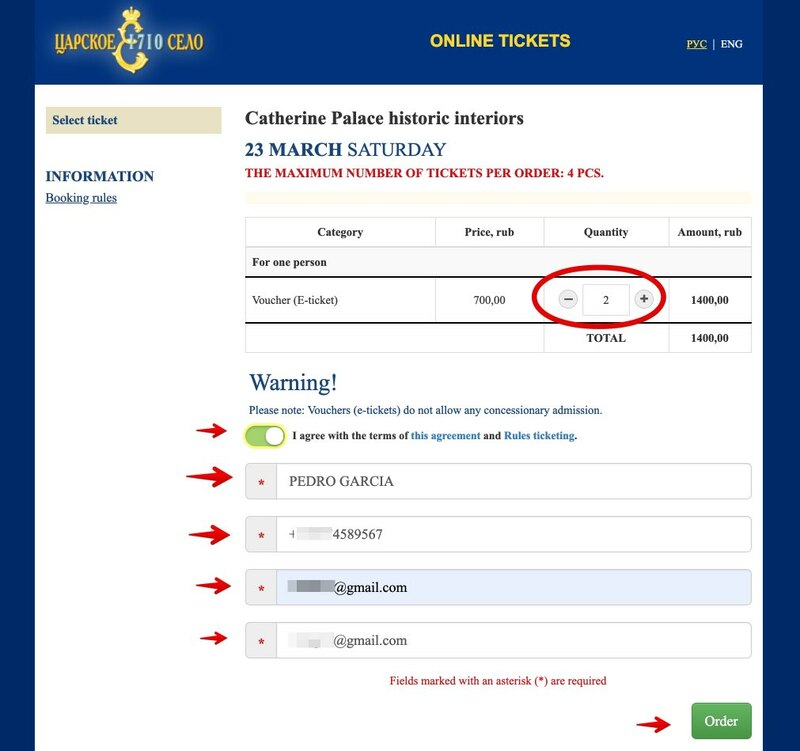 The online ticket does not include the ticket to Catalina Park, which must be purchased at the ticket office in the Palace lobby. It costs 150 rubles, however, the visit to the park is free from the end of October to the end of April. 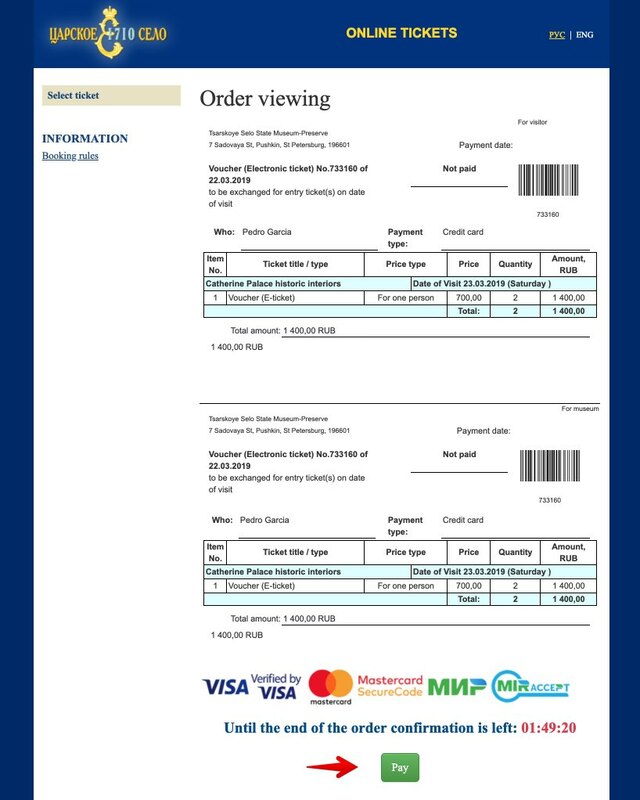 The voucher that you obtained during the purchase process must be printed and present it the day of the visit in the Palace to redeem it in special ticket offices. They may possible ask you for a proof of identity as the ticket holder (passport, identity card, driving license, etc.). Where the voucher is redeemed? 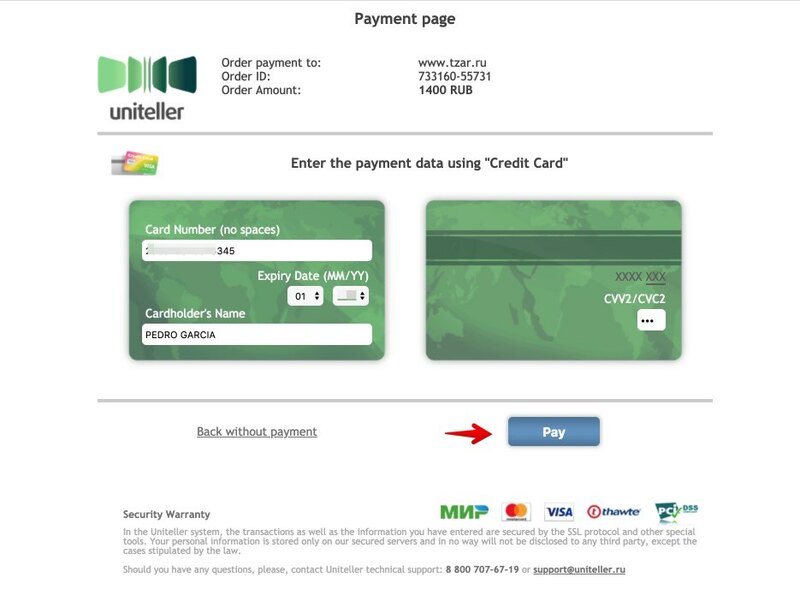 In winter (October to April), the voucher must be redeemed at the ticket office Number 4 in the main lobby of Catherine’s Palace (which you enter from Catherine’s Park). There is a cafe in the lobby of Catherine’s Palace, a summer café in the gardens of Catherine’s Park, as well as two restaurants and several fast food kiosks. 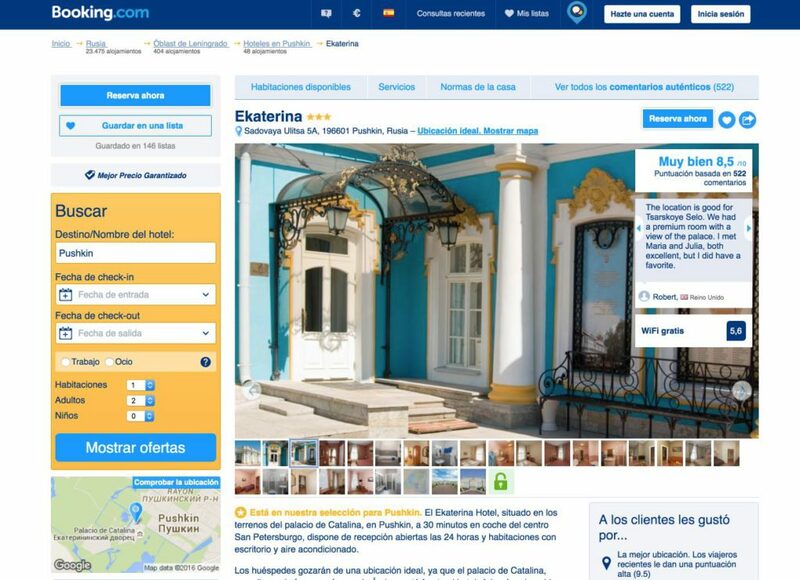 If you want to stay overnight in the town of Pushkin, accommodations include the Hotel Ekaterina (three stars), managed by the administration of the palace and located in the palace grounds. It can be booked through Booking. If you are looking for a tour of the palace in English, a good option is to consult the different guided tours offered by GetYourGuide, and which can be booked online in advance. I recommend this guided tour in English: 4-Hour Private Tour to Pushkin by Car.